The old saying that a picture is worth a thousand words is probably just plain logic when it comes to graphic designers. The use of icons and vectors has been constantly replacing the text even when it comes to web designs now. Here are some of the icon sets that fall under the category of ghost icons. Something similar is Snapchat’s current icon. Scroll through the article to find out more about them. Here is a series of outlined icons comprising of a skull and a scary character. The design is called Boo Radley and is on Behance by the creator Zach Roszczewski. Here are some funny cartoon-like ghost icons. While some of them look scary, almost all of them look super adorable.You may also check Cartoon Icons. In the link mentioned below, you will find the widest range of icons for the given theme. Flying souls to skulls to bats, you will find them all here. Here is a set of 9 different vector icons for the theme of Halloween. The vector design of the cartoon ghost character can be downloaded as an Illustrator file if you want to customize and edit the original design. This is a set of elegant and playful looking ghost icons available on CreativeMarket. The download will include editable vector file along with jpeg and png. Here is a series of 9 flat icons again corresponding to the theme of Halloween. The vector illustration is available in a high resolution and several sizes to pick from. This set is a notch above the rest with its professional designs for pumpkin, Dracula, werewolf, Frankenstein, alien, and mummy icons on GraphicRiver by Dashikka. This is a big collection of colorful Halloween icons like lanterns, bats, ghosts, witches, spiders that you can use to create amazing Halloween themed party invitations. Here is another cute set of ghost icons that is available in a single vector illustration. Each of these icons can be isolated using Illustrator and used separately for different projects. 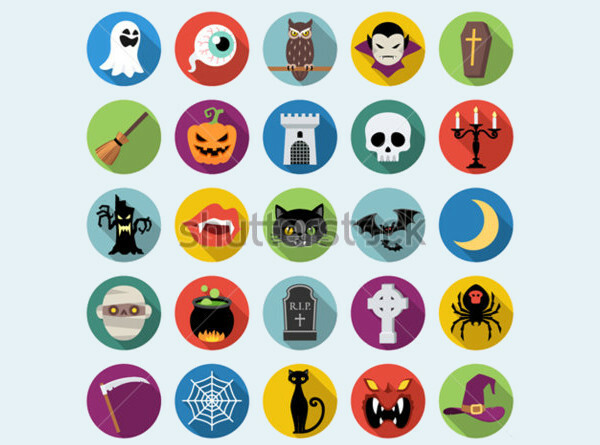 Check out this amazing, freehand Halloween icons available on GraphicRiver. These designs, set in black and white can be downloaded as vector illustrations from the given link. You can download this cool looking icon set from CreativeMarket either as an EPS file, or an Illustrator file or as a high-resolution JPEG image (5000 x 5000 pixels). Here are 30 great looking Halloween icons in a flat design with long shadows. The high-quality vector design can be downloaded from ShutterStock from the given link. Check out these brilliant cartoon ghost character icons set in white and blue. You can use these icons in your web and print designs for a horror weekend event or a dinner invitation. This is a cool design by Tanya Maifat on Dribble. This set of icons was created to cater to a project of SmashingMagazine. You can check out the design for some inspiration and ideas. Check out this link to all the ghost icons there possibly are available on the site IconFinder. The use of these icons is not just subjected to children’s birthday party. These icons can be used efficiently for promoting an event themed around horror and spookiness as Halloween is still a few months far away. Some of these designs can also be used on your desktop and personal computer as a folder icon or a favicon for your website.